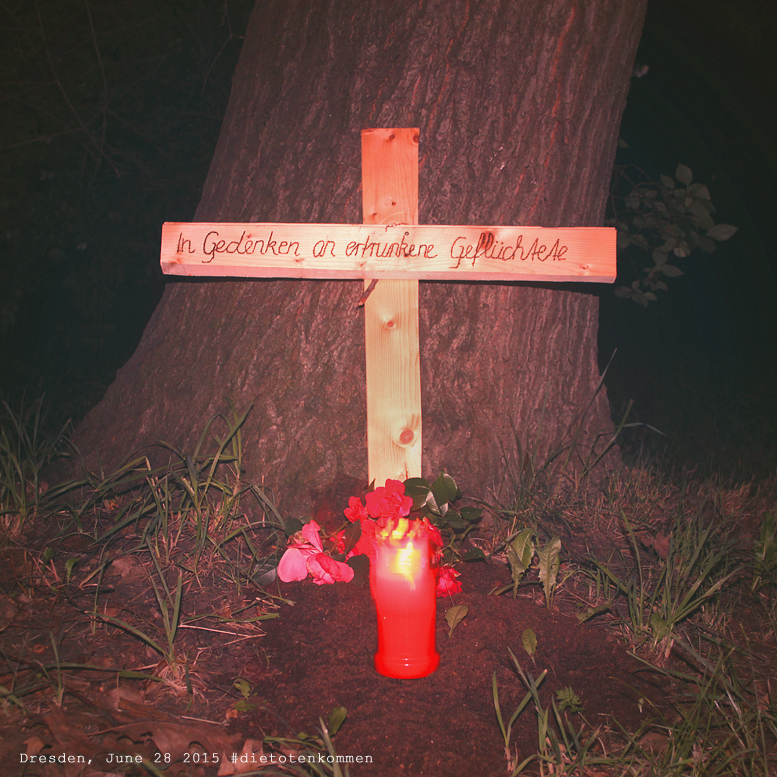 If you are wondering about the grave-cross photo I posted last night, here is the background story: the “grave” is part of a nation-wide campaign against European refugee policy. Berlin art group, “Zentrum für Politische Schönheit”, calls out to create awareness and establish artificial graves all across Germany and Europe in memory of the unknown refugees that died when trying to cross the Mediterranean Sea. Part of the campaign is also the transferring of bodies of dead refugees to Germany for giving them a proper burial and giving relatives the possibility to say goodbye in a respectful manner. Their activism is of course not welcomed by the German government. However people all across the country and the EU can take part in the activities that aim to create awareness, as opposed to ignorance and looking away from what is happening at the Southern European border. It was a surprise to find this “grave” last night. I’m occasionally lighting grave-candles here in necromantic cross-road workings. I’m usually honoring Hecate and other, known and also unknown dead, e.g. I also give offerings to anonymous dead. Now I come here and find a grave with offerings, looking so familiar. I really do support the cause behind it. In turn for donations you can chose to receive art items, postcards, posters, shirts etc.